Two sisters accused of binding babies to their beds with blankets during naptime at a Livermore child care facility were arrested Wednesday morning and are facing a slew of child abuse and neglect charges. Nazila Sharaf, 35, of Dublin, and Lida Sharaf, 33, of Mountain House, were arrested in their respective cities Wednesday morning, Livermore police spokesman Officer Steve Goard said. They are being held at the Santa Rita Jail in lieu of $700,000 bail. Both women face three counts of felony child neglect and abuse and four counts of misdemeanor child neglect and abuse, according to the Alameda County District Attorney's Office. Police said seven out of 19 babies in their care were victims of "swaddling abuse" at Sunnyside Infant and Preschool center in Livermore. Three suffered respiratory problems. Livermore police ended their investigation on Friday, one month after they were asked to help the California Department of Social Services in the closure of the Universal Preschool LCC, at 1040 Florence Road in Livermore, formerly known as the Sunnyside Infant and Preschool. 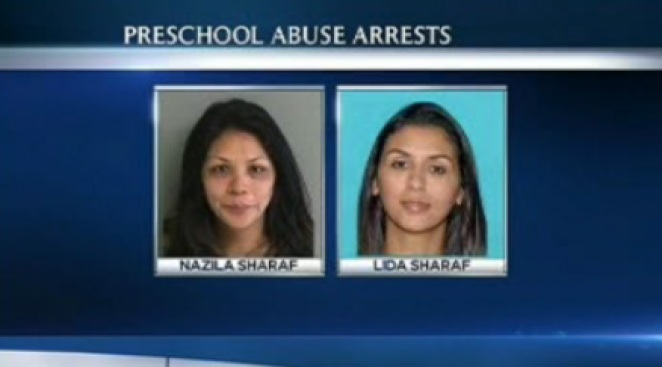 According to Goard, an extensive investigation that involved interviewing more than 30 parents revealed that both Nazila Sharaf and Lida Sharaf were allegedly binding at least seven of the babies' upper torsos and legs with blankets and other cloth-type materials in order to restrict their movement during naps. "It was like a boa constrictor wrapping around the chest," Goard said. Using knots as fasteners, the sisters restricted the babies' ability to breathe comfortably and move their arms and legs, he said. Police also said the suspects threw blankets over the babies' faces, and that with their extremities tied down, the infants couldn't move the blankets. The babies ranged in age from 7 to 11 months old. "Having knowledge of the respiratory conditions, the two suspects still tightly bound the victims' upper torso and legs," Goard said. "Tightly binding a child with an upper respiratory condition seriously compromises and child's ability to breathe, which could lead to death." Authorities were alerted of the alleged crimes by a 19-year-old former Universal Preschool employee who quit in late 2011, Goard said. "I believe this is the definition of courage -- to see what is going on and to quit out of disgust -- she was adamant and was going to let someone know there was something wrong going on there," Goard said. "She blew the whistle." The former employee, whose name has been sealed to protect her privacy, filed complaints with the Department of Social Services, which conducted its own investigation. According to Goard, swaddling of an infantover the age of 6 months should be done only at the request of the parent. This is not Nazila Sharaf's first brush with this type of licensing violation, Goard said. He said that Nazila Sharaf previously owned the Sunnyside Infant and Preschool at the same location, but that the license was revoked in 2010 under similar circumstances. "In March 2011, Lida got approval and opened up in the same place but under a different name," Goard said. "They were both owners of it and the second time around they used Lida's name to get around Nazila being prohibited due to the state licensing violation." Phones at the child care facility went straight to voice mail. On its website, the child care facility states, "It is our philosophy that children learn best in an environment that is uninhibited and filled with enriching opportunities."